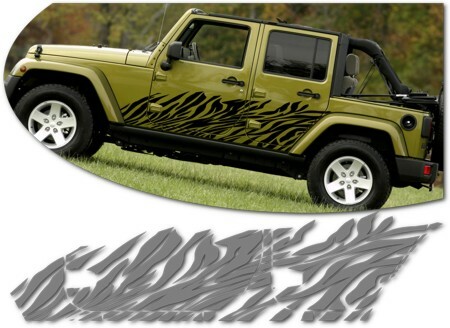 Set your '07-Current Jeep Wrangler apart from the rest with this unique Zebra inspired Savanna Body Side Graphic kit. As you can see, stripe package is not just a set of universal graphics in a box. This Kit consists of pre fit, pieces as shown. Kit is specifically made for '07-Current Jeep Wrangler Two (2) or Four (4) Door body side areas per application chart below and will not fit any other vehicle. Factory decals found on Front Fenders require removal prior to graphic application or trimming around upon completion of graphic installation. Re-installation of such decals is solely by choice and not required. Decals may be relocated to a more suitable area.